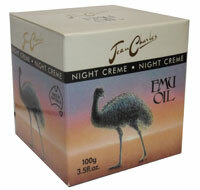 Emu Oil Night Creme is an exciting, fresh creme blended with Emu Oil, Vitamins E & A and other essential oils. The secret to healthy, younger skin is pure simplicity and we have found it in this wonderful natural product. Used nightly, this creme helps to insulate skin from premature aging factors.